So begins the diary of 14-year-old Jenna Samuels, who is having a very bad eighth-grade year. Her single mother spends all day in bed. Dad vanished when she was eight. Her 16-year-old brother, Casey, tries to hold together what’s left of the family by working two after-school jobs— difficult, as he’s stoned all the time. To make matters worse, Jenna is sick. When she collapses one day, Casey tries to race her to the hospital in their beat-up Prius and crashes instead. Jenna wakes up in the ER to find Casey beside her. Beatified. Literally. The flab and zits? Gone. Before long, Jenna figures out that Casey didn’t survive the accident at all. He’s an “A-word.” (She can’t bring herself to utter the truth.) Soon they discover that Jenna isn’t just dying: she’s being poisoned. And Casey has been sent back to help solve the mystery that not only holds the key to her survival, but also to their mother’s mysterious depression and father’s disappearance. Like the quote above in the description says, The Sweet Dead Life starts out with us finding out that something is wrong with Jenna's health and that her brother is a perv. I thought this was a hilarious way to start the book and really shows the sibling relationship between Jenna and her brother Casey. That was definitely my favorite part of this book, was Jenna and Casey relationship. It was very sweet and honest to how siblings are. The Sweet Dead Life is also told in diary format. I do kind of like when books are like this because you really feel like you're getting in the characters head, but you can also understand the sense of time that has past. I think the characters were also well done. Jenna really stuck to her personality through out the book and felt like a very genuine character. The only thing that I didn't really get is that we are told she is thirteen, but she doesn't act like a thirteen year old at all. She acts more like sixteen and I think that it would have been more believable if that's how old she was. There really wasn't any significance or anyway to tell that she was thirteen. I think she definitely could have played an older character and it wouldn't have changed the dynamics of the book at all. In the book there is also a side character, Amber. Jenna is very wary of her and doesn't understand why she keeps hanging around her and her brother. I felt the same way that Jenna was about why Amber was hanging around, but when we finally figure out whats going on I wish we would have figured out all of Amber's past. She only gave us small insights and I just wish we could have figured out the whole truth. I really liked the mystery aspect of the novel and trying to figure out who did it. The only problem I had with it is that I figured out a little bit before they did and I wanted them to just wake up and realize who it was. Also when they do figure it out I didn't like that they just up and decided to go confront them with no plan. I watch a lot of cop shows, so even if they would have got a confession, what were they going to do? It wouldn't hold up in court. It just seemed weird that they went in without a plan. 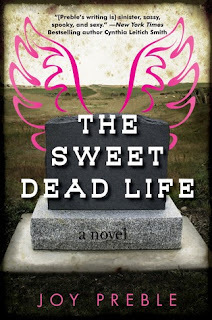 I really liked The Sweet Dead Life. I really liked the story line and overall pace on everything that happened. It wasn't too fast or too slow. I also really liked the relationship between Jenna and her brother Casey. It seemed really genuine and true to how siblings really are. I also really liked the mystery element of the story. I am really liking mysteries lately and this just fit that need. The only thing that I didn't really like is their plan to confront the enemy without any real plan in mind. Overall, I really liked the story and enjoyed reading it. The characters and mystery sounds great.